When Yang Yu, VG16, arrived in the Yushu Tibetan Autonomous Prefecture in southern Qinghai, China, the first thing she noticed was the dogs. Huge and black with thick ruffs of fur like lions’ manes, Tibetan mastiffs were everywhere. Many were leashed, lying in people’s yards to guard their houses. But plenty weren’t: Yu saw them sleeping in the streets, begging scraps from monks at monasteries, and, in one case, dozing under a prayer wheel. 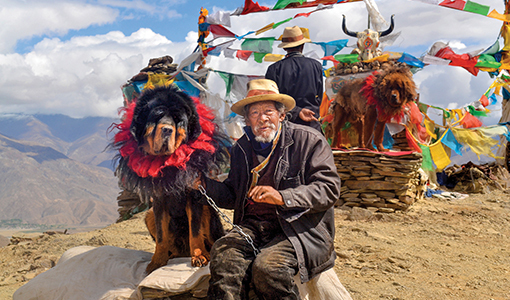 Many locals take them for granted, but free-ranging Tibetan mastiffs are a growing problem on the Tibetan plateau. The dogs were initially bred in large numbers as pets for government officials and Chinese city dwellers, but it wasn’t long before owners began abandoning them. The dogs were tough to train, their coats too thick for the urban heat, and their fierce loyalty made them attack visitors. “If smaller dogs bite you, you just bleed,” Yu said. “If you get bitten by a Tibetan mastiff, you may lose a hand.” That’s not an exaggeration—in a few cases, dogs killed their owners. Yu, an M.S. 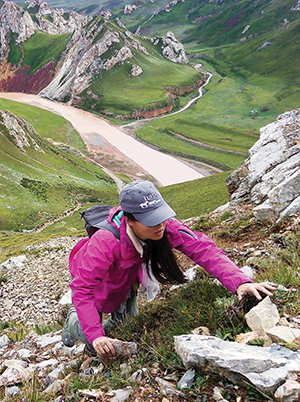 in conservation medicine graduate, came to the Qinghai Province in 2016 as a program coordinator at Gangri Neichog Research and Conservation Center to help do something about the growing numbers of free-ranging dogs. After demand for the mastiffs plunged a few years ago, breeders began abandoning them near monasteries, where the monks would feed them. The dogs overran the villages around the monasteries, and the problems started. Over the course of a year, Yu and her team worked to document the extent of the problem, and then propose solutions. They set up infrared cameras to study the dogs, helped create and distribute brochures on managing them and preventing disease through good hygiene, and collaborated on a documentary that won two awards at the Shanghai International Film Festival. But getting the local community to take up solutions has proved a challenge. The most obvious—if grim—solution is euthanizing the dogs, but killing animals is forbidden by Tibetan Buddhism. One monastery did support a proposal by Yu and others to sterilize the dogs, and villagers allowed Chinese veterinarians to perform the procedure on 26 adopted female dogs and train Tibetan veterinarians to do it. But in areas without monastery support, most veterinarians see sterilization as a “low job.” Another monastery ran a campaign that led hundreds of villagers to adopt dogs, but most new owners ended up letting the dogs run free or abandoning them altogether. Despite these imperfect attempts, the most viable solution likely lies with monasteries, which could take the lead in promoting sterilization and offer awards for adopting the mastiffs long term.